Want to help with Rainbow Bingo? Rainbow Bingo is this fun, new take on a senior center classic - BINGO. We have an OUT-rageous hostess, adult beverages, music, costumes, split-the-cash raffles, prizes of all sorts, fun....and....B-I-N-G-O! Volunteers are VITAL to the Senior Center and there are many ways to get involved and give of your time. All levels of volunteering are greatly appreciated. There are many opportunities for all to get involved. ​Thrift Store: Shifts are 4 hours long and volunteers are asked to commit to a regular schedule. Store is open Mon - Fri 9am - 4pm. We would like to be open on Saturdays 10am - 2pm but we need volunteers. We need a team of 3 or 4 regular volunteers to handle receiving, sorting and organizing the many donations we receive each day. There are no sales duties involved. ​Rainbow Bingo Team: Looking for fun while you volunteer? 8 volunteers ready to assist with Rainbow Bingo events in 2018 are needed. Positions include: registration, bingo 'tracker', raffle sales, bar tender, decorator, and clean up. (425-888-3434) or stop by during business hours. 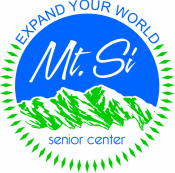 Complete a volunteer application and email it to programs@mtsiseniorcenter.org or contact us below with your request for more information. I want to know more about volunteering at MSSC! ​We value our volunteers and the work you do for the Mt. Si Senior Center. As a volunteer you deserve to be informed and well prepared. We also believe that trained volunteers are essential to our quality programming. Whether you are brand new or a seasoned volunteer, this session will provide you helpful information as you continue to serve in our organization. Board member Cindy Snyder leads the orientation. The Retired Senior Volunteer Program (RSVP) is a nationwide volunteer program, that helps you use your life experience and skills to help others. To qualify you must be: over 55 years of age; able to volunteer a few hours every week; and enjoy working with others. RSVP volunteers not only get the satisfaction of knowing they have made a difference, they also are eligible for supplemental accident and liability insurance.